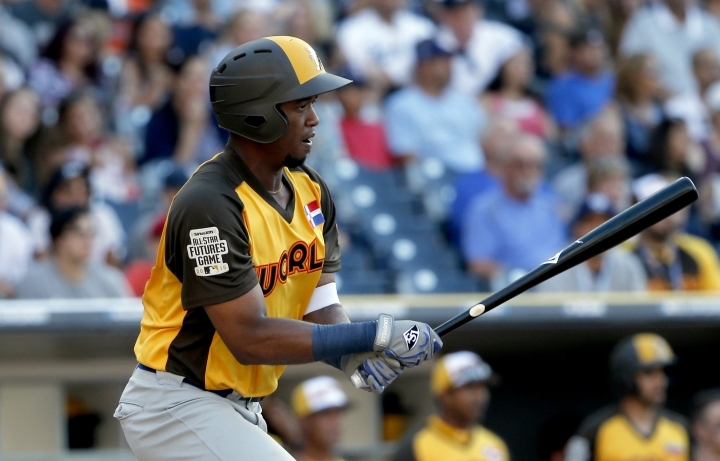 PHOENIX — The White Sox confirmed Tuesday what a $43 million contract seemed to signal: Eloy Jimenez will begin the season in the major leagues. Chicago's prize prospect will make his big league debut on opening day at Kansas City on Thursday. Signed as a teenager by the crosstown Cubs out of the Dominican Republic in 2013, Jimenez is one of baseball's most promising youngsters — and one with historic financial security. "It's amazing. I feel really proud of the work I have done," Jimenez said. "It's a dream all the players want, to break with the team in spring training." The White Sox announced Jimenez had made the team following a 7-1 exhibition win over the Arizona Diamondbacks. Jimenez was sent to minor league camp two weeks ago and was unlikely to crack the opening day roster until agreeing to a $43 million, six-year contract Friday, the largest deal ever for a rostered player with no service time. The deal, which also includes team options for 2025 and 2026, took away Chicago's incentive to stash Jimenez at Triple-A for a few weeks and delay his potential free agency. Jimenez, 22, hit .243 with two doubles, two homers and six RBIs in 37 at-bats this spring. He started in left field the last two games and is expected to see regular time there. He hit. 337 with 22 homers and 75 RBIs in 108 games between Double-A and Triple-A last season. The White Sox acquired him in a package from the Cubs for left-hander Jose Quintana at the 2017 trade deadline. Jimenez received a $5 million signing bonus as part of the deal and will make $1 million in 2019, $1.5 million in 2020, $3.5 million in 2021, $6.5 million in 2022, $9.5 million in 2023 and $13 million in 2024. The White Sox have a $16.5 million option with a $3 million buyout in 2025 and an $18.5 million option with a $3 million buyout in 2026. If he has Tommy John surgery at any time through 2026, the White Sox have the right to retain Jimenez for 2027 at $18.5 million. If Jimenez wins an MVP award during the first six years, the 2026 or '27 option would increase by $2.5 million, and if he finishes second or third the option price would go up by $1.5 million. Jimenez also would get a $100,000 bonus for winning an MVP, $90,000 for second, $90,000 for third, $70,000 for fourth and $60,000 for fifth. He would get $25,000 for starting the All-Star Game, $15,000 for selection as an All-Star reserve, $25,000 for a Gold Glove, $15,000 for a Silver Slugger, $50,000 for becoming a Sporting News All-Star, $75,000 for League Championship Series MVP and $100,000 for World Series MVP. If the White Sox had chosen to keep him in the minor leagues for the first 20 days of this season, his free agent eligibility would have been pushed back a year, until after the 2025 season. 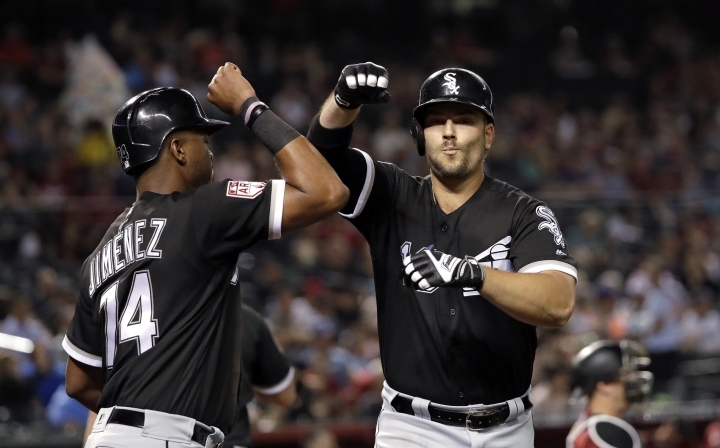 Jose Abreu, Daniel Palka and Welington Castillo doubled and right-hander Ivan Nova gave up one hit and one run in three innings for the White Sox on Tuesday. Nova struck out three and did not walk a batter. He is scheduled to start the fourth game of the regular season at Cleveland on Monday. Jake Lamb had two hits and homered for the second straight game and Merrill Kelly gave up nine hits and six runs in 5 2/3 innings, with one strikeout and one walk for Arizona. Kelly is scheduled to pitch the fifth game of the regular season at San Diego on Monday. White Sox: Jon Jay (hip) missed seven days before returning to the field Sunday, and the team was still deciding whether to place him on the injured list for the start of the regular season. Diamondbacks: LHP T.J. McFarland (shoulder) and RHP Taijuan Walker (elbow) will open on the injured list. Walker is at least a month away, manager Torey Lovullo said, after undergoing Tommy John surgery last April 25. White Sox left-hander Carlos Rodon is set to face Kansas City right-hander Brad Keller in the season opener for both teams in Kansas City on Thursday. Diamondbacks right-hander Zack Greinke will face Dodgers left-hander Hyun-Jin Ryu on opening day at Dodger Stadium on Thursday.